Here’s an overview of the different ways to setup live preview of AsciiDoc. All you need to preview an AsciiDoc document in a web browser is to install the Chrome extension, the Firefox add-on or the Opera extension. Then you can see the AsciiDoc file rendered as HTML just by visiting it! The validation process of a browser extension / addon can take a long time. If you want the latest and greatest version you can use the direct download links below. Install Brackets. Then from the Brackets file menu, open the extension manager. Browse available extensions and install AsciiDoc Preview. Install the open source plugin AsciiDoctor Editor from Eclipse Marketplace or visit project site at GitHub. Install the community plugin AsciiDoc. Next, create a file named Guardfile in the same directory as your document. Configure Guardfile to monitor the file (or files) you are editing and then regenerate the HTML file whenever a change is detected. Whenever Guard detects a change in the mydoc.adoc file, Asciidoctor will process it using its convert API and update (overwrite) the mydoc.html file. Instead of monitoring a single file, you can monitor all files matching a regular expression. In the watch block, replace mydoc.adoc with . *\.adoc to monitor all files that end in .adoc in the current directory. Create a file named Guardfile in the same directory as your document. Configure Guardfile to monitor the file (or files) you are editing and then regenerate the HTML file whenever a change is detected. Next, install Epiphany (now called GNOME Web). Alternatively, you can use any browser with an auto-refresh plugin. Epiphany just happens to do it out of the box by monitoring the file system for changes (similar to how Guard works). Open Epiphany (GNOME Web) (or your web browser of choice w/ the auto-refresh plugin) and navigate to the mydoc.html file. Also open up the source file in your editor. Put the windows side-by-side so that you can see both of them. (Use Alt+F5 to unmaximize Epiphany (Web) if you don’t see the draggable window frame). Once the two windows are tiled, make a change to the source document. Observe that the preview is automatically updated without affecting the scroll offset. 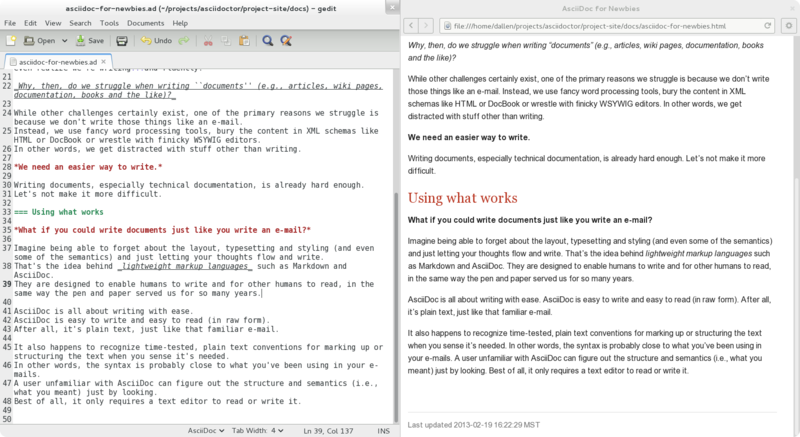 Asciidoctor + Guard + Epiphany (Web) == Doc writing pleasure! Below are some other tools you can use to setup a similar environment to the one described above. You can setup LiveReload (for free) on any operating system using the Guard::LiveReload plugin and the companion LiveReload extension for Chrome or Firefox. Next, install one of the two browser extensions. After installing the Chrome LiveReload extension, you need to check the "Allow access to file URLs" checkbox in Tools > Extensions > LiveReload in order for it to work with local files. Add the following stanza at the bottom of the Guardfile you created above. Start Guard, navigate to the HTML file in your browser, then activate the LiveReload on that page by clicking the LiveReload button in the toolbar. Whenever the AsciiDoc file is changed, first the Guard "shell" plugin will be triggered to generate the HTML file, then the "livereload" plugin will be triggered to send the HTML to the browser.